Earlier I shared an educational problem that scholars have described as a crisis in poor critical thinking training found in American schools today. We must still better appreciate the value of an argument-skills curriculum. Over the last 20 years, there has been an increased interest in the study of the skills required for argument. The understanding of arguments has been studied in social psychology (persuasion and attitude change) and in cognitive and developmental psychology (reasoning). There are many ways to know in addition to reason such as through emotion, sense perception or authority, but my interest here is in the development of reason. Reasoning consists of the human capacity to establish and verify facts and can be distinguished from intuition, the capacity to acquire knowledge without the use of reason or inference. Humans have the unique capacity for reason like no other living creatures and many scholars have claimed that the primary function of reasoning is argumentative (Sperber, 2000a; 2001; Billig, 1996; Dessalles, 2007; Kuhn, 1992; Perelman & Olbrechts-Tyteca, 1969). "Reasoning has evolved and persisted mainly because it makes human communication more effective and advantageous," (Mercier & Sperber, 2011). It is through argument that reasoning can be actualized. Argumentation has been investigated from within a large range of subjects: juror reasoning (Pennington & Hastie, 1992; Kuhn, Flaton and Weinstock, 1994), political science (Finlayson, 2004), economics (Voss, Blais, Means, Greene and Ahwesh, 1986), moral thinking (Anderson et al., 2001; Narvaez, 2001) and media analysis (Limon and Kazoleas, 2005). It seems that very little has been investigated within the domain of religious textual studies. Many have suggested that an appropriate argument curriculum can be applied to all subjects of study. While contemporary argumentation theorists consider argumentation to be interactive, social, dynamic and dialogical, consistent with social constructivist perspectives, there is disagreement about the most effective learning approach. To what extent must the cognitive and social processes be integrated? How can it best be assured that students learn to construct two-sided arguments and can learn to distinguish between explanations and evidence? The three primary educational mediums for the development of these argument skills have been: oral, written and web-based discussions. Exercises of oral discourse (Baker, 1999; Chinn, O'Donnell and Jinks, 2000; Mercer, 1996; Reznitskaya et al., 2001) ensure that students are discussing matters face to face. Exercises involving writing an argumentative text (Wiley and Voss, 1999) intertwine writing skills with argument skills. Web-based discussions (Andriessen, Baker and Suthers, 2003; Koschmann, 2003) combine the first two approaches -- partners communicate with one another only through the medium of writing. Some researchers have suggested that in computer-based argumentation, student arguments can often be "shallow and unfocused" and that "discussion threads diverge in multiple directions," (Andriessen et al., 2003). Another debate has evolved around whether argument exercise should be supplemented by frontal teaching. Kuhn et al. (1997) and Lao and Kuhn (2002) have demonstrated that extended engagement in argumentative discourse, without any other instruction, is sufficient for the improvement of the quality of arguments produced by students. There is an important practical and intellectual distinction between the experiential teaching approach and the direct instruction approach. Britt (2008) argues for the direct instruction approach (where information is imparted to students frontally and directly with students) and that there should be frontal teaching and training in philosophical language and concepts. 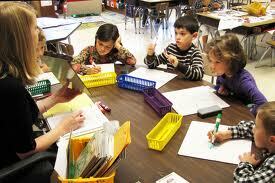 Pedagogical supports can be employed to address skill deficits (Larson, Britt and Kurby, 2012). The experiential approach, on the other hand, emphasizes engagement and practice. The choice of one model over another will not only impact how an educator interacts with students but how students engage with the course material and learn. Reznitskaya, Anderson and Kuo (2007) demonstrated how engagement in argumentation was an effective way to cultivate skill development compared to direct instruction. They found that groups receiving direct instruction increased their conceptual knowledge but decreased their procedural knowledge on how to use argumentative strategies. Kuhn, Shaw and Felton (1997) found that sustained engagement in dialogical argumentation significantly increased argument skills. Engaging in argument can help ensure the development of what has been called a "two-sided" versus "one-sided" approach (Baron, 1990; Nussbaum, 2008; Stanovich and West, 2007; Wolfe and Britt, 2008). A two-sided argument addresses the opposing argument, rather than just arguing for one's own position. It is crucial for more nuanced argument skills that students learn to engage in evidence-based argumentation where they can provide a claim which is supported by evidence or reasons that support the claim in a principled way. Yet even teachers may also have difficulty explaining how evidence can be applied in high level argumentative reading and writing (Kuhn, 2005; Langer, 1992; Langer and Applebee, 1987). Many have claimed that most teachers are unprepared to provide instructional support and facilitation for learning argument skills (Applebee, 1991; Hillocks 1999, 2008, 2010; Langer, 1992; Langer and Applebee, 1987; Shanahan and Shanahan, 2008). In addition to the development of cognitive competence, argumentative discourse can enhance crucial argument skills. Felton and Kuhn (2001) identified that the two primary areas of development in argumentative discourse are "enhanced understanding of discourse goals and application of effective strategies to meet these goals" and have found that engagement in argumentative discourse activities enhances this development. In addition to furthering students' abilities to support claims and draw correct inferences from information (Moshman, 1998), there can be development in argumentative discourse as a social phenomenon (Felton, Kuhn, 2001). Young adolescents often struggle to attend to opponent's claims and remain focused on their own claims (Felton, 2004; Felton and Kuhn, 2001; Kuhn and Udell, 2003; Udell, 2007). However when instructed to attend to the opponent's argument, students are able to do so (Kuhn and Udell, 2007). Students often fail to identify weaknesses in the opponent's arguments and to "secure commitments" from opponents to be used to support one's own claims," (Walton, 1989). Adults have greater skills in argumentative discourse than teens do, showing great competency at making counterarguments and "directing and defining the partner's argument with the intent of weakening it," (Felton & Kuhn, 2001). Through normal cognitive development, these skills develop. But students can still be enhanced in growth and these are primary opportunities for development with teens. Toulmin (1958) contends that arguments consist of a claim supported by grounds, warrants and backing. However the problem with the Toulmin model is that it is minimally dialectical and neglects a range of argumentation moves (Reed and Norman, 2004; van Eemereen and Grootendorst, 1992). Nussbaum and Schraw (2007) suggested the argument-counterargument integration for defining a well-developed argument schema and suggested three strategies that could be used to construct an integrative argument: refutation, constructing a design claim (for how a solution should be designed) and weighing (demonstrating how the positive consequences outweigh the negative). In his dialogue theory, Walton (1998) suggests that there are seven different types of argument dialogues depending on whether the goal is to persuade, negotiate, acquire information, deliberate, inquire, express emotion and grievances, or a combination of these. One learning goal is for students to become more aware of their strategies and goals and why they're choosing the approach they're using. This is part of the goal of metacognitive development. Brown (1997) suggests that incorporating reflective activities into learning helps to ensure that reasoning skills become internalized. While developmentalists have thought about metacognition for some time, the emphasis of study really accelerated in the late '70s, namely with the developmentalist, Flavell (1979). Big strides forward were made in research with the adopting of microgenetic research methods. Microgenetic methods enable the study of the process of "knowledge building," (Chan, Burtis and Bereiter, 1997) and developmentalists today have moved to researching metastrategic knowledge and meta-task knowledge in addition to meta-memory. Initially, research on metacognitive or metastrategic knowledge was focused on memory skills (Brown, 1975, 1978); however, more recently the study of metastrategic knowledge has come to include awareness, understanding, monitoring and management of one's strategic performance of many kinds of cognitive tasks. In addition to gaining awareness of the sources of one's own knowledge, a learner can gain meta-level control of his or her own knowledge mastery. In addition to students gaining a deeper understanding of material and persuading others with their arguments, it must be ensured that students can generate arguments that incorporate multiple perspectives of an issue. A primary pedagogical tool for the cultivation of argument and reasoning skills is to ensure that reflective activities are included in learning exercises. Nussbaum (2005) has suggested that the giving of "goal instructions" helps to achieve a higher awareness of the learning tasks at hand and can have substantial effects on the argumentation. Theories of experiential learning are relevant to this research project. For example, Kolb (2008) defines his Experiential Learning Theory as "a holistic model of the learning process and a multilinear model of adult development, both of which are consistent with what we know about how people learn, grow and develop," (Kolb, Boyatzis and Mainemelis, 2000, p. 2). He explains that experiential learning is "the process whereby knowledge is created through the transformation of experience. Knowledge results from the combination of grasping and transforming experience," (Kolb, 1984, p. 41 in Kolb, et al., 2000). This learning process is structured through a four stage framework including concrete experience, reflective observation, abstract conceptualization and active experimentation. The learning begins with a concrete experience forming the base for the reflective observation. These reflections are the foundation for the formation of more abstract concepts finally leading to the testing of new ideas by the student. Then the cycle begins once again with the search for a new experience. Another educational approach is to use scaffolded argumentative discourse, breaking up learning activities into different aspects. Kuhn et al. (2008) have suggested three techniques designed to heighten and support metacognitive awareness of discourse: 1. working in collaborative pairs; 2. integrating explicit reflective activities into a series of dialogs; 3. conducting dialogs via computer-supported instant messaging software, which makes them available for reflection. Argumentative discourse, in addition to argument skill, also demands epistemological understanding (Chandler, Boyes and Ball, 1990; Kuhn, Cheney and Weinstock, 2000; Mason and Boscolo, 2004). Individuals will not be inclined to engage in argument if the positive benefits of such practices are not understood. One study examined the use of AVDs (argumentation v-diagrams) to further argument and counter-argument integration. Students would draw a "V," write their arguments on the left side of the "V," the counter-arguments on the right side of the "V," and their potential conclusions at the bottom of the "V." Researchers found that students who used v-diagrams were more likely to compromise in their positions and to change their positions than students who did not engage in this activity (Nussbaum and Schraw, 2007). Students who pause to reflect on their position and the position of others are more likely to hold multiple possible positions. The development of metacognition will help ensure students are more reflective about their reasoning and evidence. In addition to having students develop stronger arguments they can accumulate more doubt that the opposing position isn't necessarily false. Kuhn and Weinstock (2002) propose that "the development task that underlies the achievement of mature epistemological understanding is the coordination of the subjective and the objective dimensions of knowing." Creating a balance between the objective and subjective knowing requires that students embrace evaluation through evidence (objective) and a doubt of certainty (subjective). While assertions made are judgments (objective) there is an acknowledgement that reality is not directly knowable and that knowledge is generated by human minds (subjective). By integrating reflective activities on the objective and subjective ways of knowing, we further students' epistemic development. This epistemic development will help students develop as critical thinkers. This is the key for our future. We must ensure we are building a nation of competent citizens capable of thinking critically at work, at home and in the public arena.